Discussion in 'Lexus Lounge' started by krew, Sep 12, 2018. Reviews from around the world. Motor and LDeleuran like this. Everything falls apart for me when you get to the rear. The price is good and I don’t care much about speed. Interior is clean. The CHR is the ugliest thing on the road right now and I fear if I buy this I will just keep seeing that way too high squared off behind on my UX. Wow. It is shockingly poorly reviewed! I will have to sample that back seat, infotainment and check out the boot space of the hybrid, because those reviews sound almost too bad to be true. I can not believe the level of disinterest in the UX, though I suppose we're not part of the “urban explorer” target market. How was the CT reviewed when it came out? TBH this is a product for which reviews doesn't matter at all. People know what they sign up for when they buy an entry-level 'premium' car. Most of these U.S. reviews are indeed rather negative. It seems to me that the European press is far more positive. A lot of these U.S. journalists systematically seem willing to compare any new Lexus with a racetrack ready sportscar. What do they expect? This UX drives perfectly good. This car doesn't need to offer a milimeter precise steering feedback like a Porsche 911. It is not the sportiest, but very comfortable with enough power when needed. Compared to - for example - a BMW X1 with comparable engine power, it is far more refined, better finished, better dynamics due to the low centre of gravity, excellent short turning radius for city use, lower TCO, better value for money... perhaps a bit smaller on the inside (especially the trunk space). The UX is more of a crossover than a SUV. I do however understand the eternal criticism on the multimedia & touchpad. But even regarding this item, the critics are often based on a very short usage time. If you are used to the system after - let's say - a week, for 80% of the functions it is OK. Not the best on the market, but OK.
Wining engine sound of the CVT is present, but far less than in some other (Toyota or Lexus) models and is only a bit disturbing for the short time on full power when overtaking on a motorway. Rob Grieveson, internalaudit, LDeleuran and 4 others like this. I can only speak for Europe. Here it received rather disastrous reviews, with some of the reviews even speaking falsehoods about the car. One instance was so grievous that I called them out on facebook (A Danish rag complained about poor fuel economy while referring to the lifetime average). The poor reception has consequences. Lexus withdrew from the Danish market the following year. I had high hopes for the UX (even though I'm disappointed with the rear bar assembly not being a single piece), so I am wondering how much effort it would take to double check the negative claims that have been uttered. UX has been one of the better reviewed Lexus products.. not sure where are you guys seeing all the negativity. Even US sites were pretty positive. Of course, it is $32k, it is 4.4m vehicle and shallow boot and 167hp engine. Once we are past that, it is nicely reviewed. While the Lexus UX is based on the same platform as the Toyota C-HR, it’s a very different ride that’s been given the full Lexus treatment. The UX has a rosy future — there’s quality throughout, and the intriguing hybrid powertrain delivers both perky performance and excellent fuel economy. There are fully-electric alternatives on the way from Jaguar and Volvo, but punitive pricing rules them out for most buyers. The UX offers a flavour of electric motoring at a price point in line with petrol and diesel rivals. That’s the lure. The high-end finish and the driving pleasure are what will get potential buyers to sign on the dotted line. Lexus took a little longer than others to make a subcompact luxury SUV, but the UX proves to be a worthy addition to the Japanese automaker’s stable. We suspect it will find a ready audience. As a de facto replacement for the luxury automaker’s formerly least-expensive car, the Lexus CT 200h that went out of production last year, the UX brings more of what today’s buyer’s want: the higher seating position and practicality of an SUV, available all-wheel drive, the latest safety systems, and technology like standard Apple CarPlay and Amazon Alexa integration. We enjoyed our first sample of these pre-production versions of the Lexus UX. On the other hand, the UX arguably offers a better value-for-money equation than its rivals, with all the technology and style some customers are looking for in what may be their first luxury car. For that reason, it's bound to be a hit with shoppers. 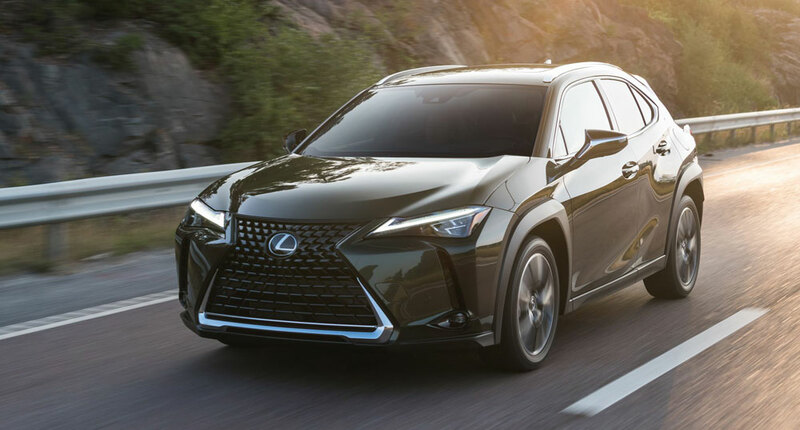 These types of vehicles are the hottest thing going -- crossovers and SUVs already account for 69 percent of Lexus sales -- and the 2019 UX is the ideal vehicle to capitalize on that craze. I happen to think that materials throughout the cabin are probably the best I've come across at this level - even down low the plastics are of decent quality. As rivals include Audi Q2/3, Mercedes GLA, BMW X1, Volvo XC40, that is saying something. The UX is firmly part of a newer generation of Lexus cars that really do go around corners well and ride better than their predecessors. With a seating position lower than other SUVs, the UX is more car-like to maneuver, and combined with lightweight aluminum and composite panels, Lexus claims the UX has the lowest center of gravity in its class. Either way, there is a surprising agility on twisty roads, improved further by Active Cornering Assist, which monitors the trajectory through curves and applies the appropriate braking on the inside wheels to suppress understeer. There’s no doubting that if you’re in the front, at least, the Lexus UX is a cocooningly pleasurable place in which to spend time. It soothes with its comfort, quietness and air of refinement, particularly if you stick with the standard 17-inch wheels and go for a Luxury specification model. It's too soon to make that judgment. We'll wait until we know the full details of the car and drive it on Australian roads, but the early signs are positive. Lexus has hit the target of creating a stylish and sophisticated baby SUV that will appeal to young urban professionals as well as baby boomers. I really feel that the UX has everything going for it – looks, quality, technology, value for money versus standard specs. All of which should make it Lexus’ number one seller in South Africa. We say the 2019 Lexus UX is a success, especially the hybrid. With snappier performance, improved fuel economy and optional all-wheel drive, it's our choice, even with the $2,000 hybrid price premium. Can the new UX satisfy a new group of buyers gingerly easing their way into luxury car ownership? We think so. The UX may not handle better than a BMW X1 or look as smart as a Jaguar E-Pace, but for urban-focused drivers seeking low-tax alternatives to conventionally powered cars who don’t want to pay for a PHEV or EV (and their current compromises), this capable hybrid is a compelling choice. The UX might be slotting in close to the bottom of Lexus’ model hierarchy, but first impressions indicate that it’s one of the company’s most well-resolved cars – and easily its most fit-for-purpose SUV. Positioned to snare younger buyers to the brand commonly associated with retiree-age customers, the UX is stacked high with technology and mod-cons and thus holds plenty of appeal for a less wrinkly generation. The most pleasant surprise, though, is that it’s genuinely good fun to drive. This is one to look out for. There could well be a very fine four-star car in the UX, but until we know for sure that production car cabins do not rattle and squeak the way the launch cars’ cockpits did and that it is priced keenly against its very capable rivals, the UX earns a solid 3.5 stars. Rest assured it is worthy of your consideration at the very least. If we handed out star ratings based on individuality alone, this quirky-looking Lexus would surely be deserving of the full five. Quick it isn’t; pulse-quickening it isn’t; and practical it may not be, but at the end of a day of driving I was surprised by how much I ended up liking the little Lexus UX. It helps that this is the first new Lexus with styling that I really get, and I’m impressed by how the designers have executed the idea of Lexus-style luxury in a small, efficient package. The Lexus UX 250h fits conceptually well to Europe, which should also be the main market. The performance is quite sufficient in itself, but inferior to the power burners of the premium competition, however. For the UX is extremely economical and probably threatened in the distant future of any driving ban. Processing and equipment levels of the pre-production test vehicles were at top level. Cant have everyone loving it, but it is certainly one of the best reviewed Lexi... pretty much all YT video reviewers mention that they think it will be great seller. mikeavelli, internalaudit, Motor and 2 others like this. ... (A Danish rag complained about poor fuel economy while referring to the lifetime average). Interesting perspective. A Kaizen Factor article I wrote on March 2016 touches upon Lexus' retreat from Denmark. I was under the impression that it was mostly the country's onerous taxation, even on fuel-sipping hybrids such as CT, that led to Lexus' departure. They make decisions based on sales not media... Lexus withdrew from quite few countries then but it is also now opening again in many of those. Now you've piqued my curiosity. The withdrawal from Denmark was probably the only one I was familiar with (maybe Egypt as well?). Do you have specific examples of other countries Lexus has withdrawn from? Or withdrawn only to return later? Lexus sold 13 cars in the last year in Denmark, (it was not a full year, though). 42 cars the year prior. The new UX and ES could do well in Denmark if it were not for the tax advantages of dirty diesels (diesel is taxed less than petrol and all hybrid components are taxed with the full 150% tax which comes after the 25% VAT! *) The official Danish Lexus website says that they are considering reentering if the market should ever seem more favorable. I applaud Toyota for trying, but that market was an uphill battle. *I am simplifying a bit. The tax for a car is extremely complicated and factors in equipment and fuel efficiency. mikeavelli and Joaquin Ruhi like this. i do expect them to return to go everywhere in Europe again, with new UX and NX, and especially whenever new CT is introduced, they will have many vehicles to sell around $40k that is the most of EU market. NX is first vehicle from Lexus in Europe whose sales did not drop heavily after first year. Boot the (UX 250 F Sport's) throttle and you're met with adequate acceleration. No concerns of a strained neck here, but also no problem to weave through traffic or keep a spirited pace on your favorite winding road. More importantly, the engine revs both briskly and smoothly, on the refined side of the inline-four coarseness spectrum. Then there’s the sound the engine makes. Or, I should say the stereo because the F Sport uses it to add extra growl to the exhaust note in all throttle applications in the sport drive mode and even more so in sport-plus. The sound isn’t bad, but it’s also not bad in normal and eco when the stereo plays no role. Hopping in a UX200 without the F Sport extras, it is immediately apparent the two powertrains are quite similar in performance. It was warm and dry on the test drive, so lacking all-wheel drive was a nonissue. You notice there’s a tad less torque in low engine revs, but otherwise the 200 moves as well as the hybrid. And this latest generation of CVT reacts better than before -- no long delays between more gas and more go. Non-F Sport UX’s do lean a bit more while cornering, but the difference is small and would only become worrisome if you plan to autocross it, which I think/hope not many folks would. The German competitors do generally offer more engaging driving dynamics, especially the X1. I'm so disappointed that the UX will have so many supposed changes and omissions for the North American market vs Europe and other markets. No AVS for the UX in North America? Run flat tires only for the UX in North America? F-Sport in North America supposedly will lack some things vs other overseas markets? This seems very disappointing. It's almost as if Lexus doesn't really want the UX to be a big seller in North America. It definitely seems to be a very European-focused model, especially with the slow performance and acceleration for both the gas and hybrid models. I shouldn't be totally surprised though, as this is a very entry level model, and I guess AVS should not be expected on a model like this (even though European markets will get AVS). I have a question and I was wondering if someone can help me identify what this particular is. However at the same time I've found other renders/pictures that show F-Sport cars withouth these pieces but rather they have a standard knob without the 3D effect. This is also confirmed by the Italian and German UX car configurator, so basically even the full optional F-Sport model (provided the configurator shows every change in the final render of course) looks like the picture above and the only way to see that particular 3D knob is by choosing a Luxury trim. Do you have any idea of what that piece is and what is its function? Is it a merely aesthetic purpose?